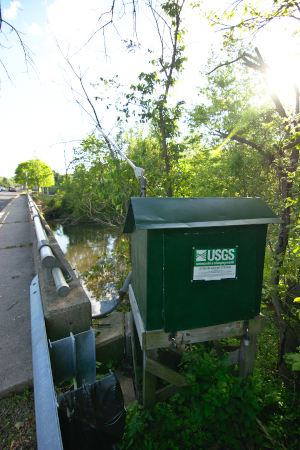 LOCATION.--Lat 40`13'45", long 75`07'12", Bucks County, Hydrologic Unit 02040201, on left bank at bridge on Valley Road, 1.0 mi east of Neshaminy, and 6.8 mi upstream from mouth. PERIOD OF RECORD.--November 1998 to current year. GAGE.--Water-stage recorder and crest-stage gage. Elevation of gage is 190.42 ft above National Geodetic Vertical Datum of 1929, from survey. Satellite and landline telemetry at station. COOPERATION.--Station established and maintained by the U.S. Geological Survey. Funding for the operation of this station is provided by the the Bucks County Commissioners and the U.S. Geological Survey. Supplied by USGS: Data transmitter operational limit - 15.0 ft, approx 11.5 ft - bridge deck on Valley Road near gage affected.